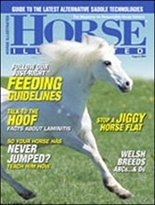 Looking for a Good Horse Magazine with General Content? A good horse magazine is seldom sinful, non-fattening, relatively inexpensive, and given the right choice, very appropriate. For the beginning rider, new horse owner, or someone who just loves all aspects of horsemanship, either of the magazines highlighted below would be a good choice. Equus , regarded by many as the #1 horse magazine, provides coverage across the spectrum of riding, horse care, tack, and training. 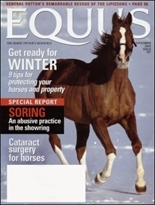 EQUUS places significant emphasis on issues of equine health, horse care and safety and is a leading magazine in this area, with much information of special value to the newer horse owner. These articles on equine health and care go into great detail and form the basis for a valuable reference library. Horse Illustrated has been around for over 25 years. That in itself attests to the magazine's quality and popularity. Horse Illustrated is geared toward the owner of a horse or three; more so perhaps than to the professional horse owner or breeder. The magazine covers both western and english riding styles. Well written articles are a trademark of this horse magazine. (the March 2004 profile of the Friesian was especially beautifully done).